Lots of Interest for Internet Safety Info – Making sense of an interconnected world. Together. 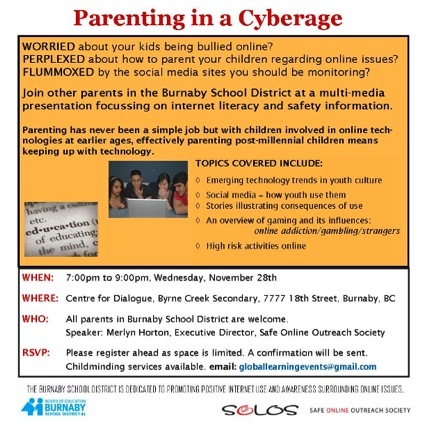 Global Learning of the Burnaby School District is offering an internet safety information session, “Parenting in a Cyberage” on November 28th at 7pm. All parents of Burnaby students are welcome, at no cost. Space is limited at Byrne Creek Secondary School’s Centre for Dialogue so all interested parents are asked to register at globallearninginburnaby@gmail.com. Lots of interest has been shown already – over 100 participants so far! Those who cannot attend the Nov 28th presentation are encouraged to attend Burnaby North’s Internet Safety session on November 27th at 6:30pm advertised on the Burnaby School District website.